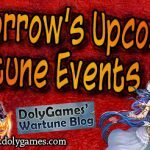 In this article I share the Wartune Events for the 2nd of February (article + video)(Eudaemon Upgrade Refine + Soul Engraving Cycle). Eudaemon Upgrade – 3 days: Use up to 1000 Blood of Zeus per day for rewards. Eudaemon Diamond Synthesis – 3 days: Synthesize diamonds to receive rewards. Level 6 to Level 12. Eudaemon Skill usage and upgrade – 3 days: Upgrade Eudaemon General and/or Active skills to receive rewards. Skill level 3 to level 8. Eudaemon Equipment Refining – 3 days: Refine Eudaemons’ equipment to receive rewards. Eudaemon Equipment Advancement – 3 days: Upgrade Eudaemons’ equipment to receive rewards.